Dodge has its own special way of getting into the holiday spirit—and, you guessed it, it does indeed involve the Hellcat. 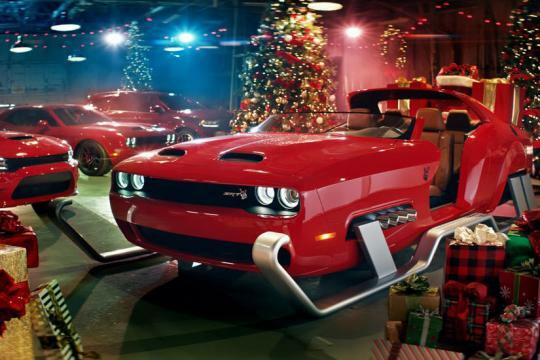 Premiering in one of the automaker's new holiday sales ads is this wild Santa sleigh that's based on a Dodge Challenger Hellcat Redeye, that 797-hp supercharged muscle car that's already plenty ridiculous on its own. From what we can see, the sleigh is a chopped-up Challenger coupe with two massive metal runners replacing the four wheels. The supercharged 6.2-liter Hellcat Hemi V-8 is said to be underhood, though we can't help but wonder how the sleigh gets all that power to the ground—er, air. Four chrome exhaust pipes sprout from the front fender, the windshield is lowered, the roof is mostly removed for an open-air feel, and there's a space for presents in the rear. The Hellcat logo with reindeer antlers in the front grille is a nice finishing touch. While other automakers such as Mercedes-Benz and Lexus have come up with similar car-sleigh mashups for past holiday seasons, Dodge has gone above and beyond the call of duty by actually building the Challenger sleigh for real. In addition to the ad campaign that is promoting various holiday sales programs, there will be a series premiering in December on several social-media platforms. It will be modeled, Dodge says, after a car restoration program to show the sleigh's various features and explain how the project came together. Dodge also hired professional wrestler Bill Goldberg to play Santa and TV personality Cristy Lee to play Mrs. Claus in the ads. And, of course, elves will be involved, too. Stay tuned to hear more about this wild holiday-themed creation as Dodge releases more information about it through its Twitter, YouTube, Facebook, and Instagram pages next month. Until then, the TV spot is below for your viewing pleasure.